(Eclectus and Toe-Tapping, Tracheal Endoscopy in Canary, Quick diagnosis of spinal cord trauma, Preventing artherosclerosis with antioxidants and much more…). 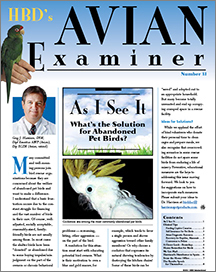 (Demac Wildlife Nutrition, repair of Stifle Luxation in Cockatiel, uses of Avizyme, beak repair tips, Diabetes Mellitus in galah, evaluating feathers, pudgie parrots, Harrison’s for lories and much more…). (possible prevention for prolapsed cloaca, Coortisteriod use in birds, bird in a bag, conversion client handout, Parkinson’s and pesticides, Avizyme, indications for High Potency use and much more). ( Maui Parrot Sanctuary, microsurgury in birds, key to effective repair of crop burn, removing eggs from egg-bound birds and much more). (educate for diet conversion, potential toxicity of grape pedialyte, glyburide for cockatiels, zinc, magnetic therapy, Itraconazole use in amazons, pigeons & hawks, Rachel Carson lives on and much more).